Sit on chair or bench with can on floor. Place foot perpendicular on can's side so foot's arch sits on top of side of can. 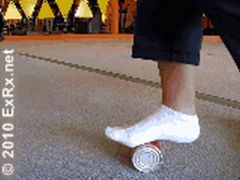 Push foot down gently onto can while rolling arch of foot back and fourth on can. Roll foot back until can is under front part of foot's arch. Roll foot forward until can is under rear part of foot's arch. Continue to roll back and forth. Repeat with opposite foot if prescribed. Plantar Fasciitis treatment. Tennis ball or frozen may also be used.